The following is the text of a talk given by Dr Graham Dawson, Chairman of the Southwark and Lambeth Archaeological Society at their symposium held on 26th March 2002. It is reproduced with the kind permission of that Society. Domesday Book. 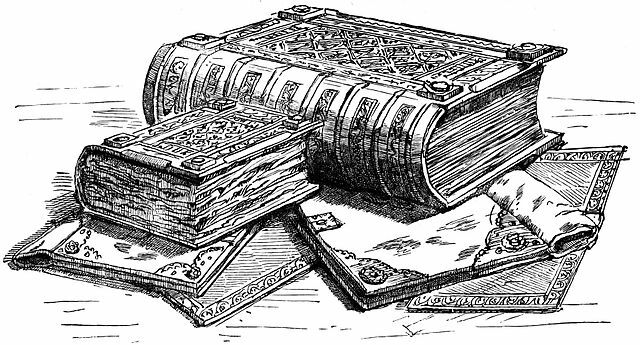 “Domesday Book” by Andrews, William – Andrews, William: “Historic Byways and Highways of Old England” (1900). Licensed under Public Domain via Wikimedia Commons. I thought it would be a good idea to mark the Queen’s jubilee by looking at occasions when the monarch had a close connection with Southwark and Lambeth, which all happen to be before 1600. If we start where local histories usually start with Domesday Book, we find that most of Southwark and Lambeth were, or had recently been, in royal hands. This is most clear cut with Bermondsey which was held by the King in Domesday Book and this then included Rotherhithe, or at least the larger part of it. Though none of Lambeth was then held by the King I have argued that it was a royal manor until c1050 when it was divided into three parts, Lambeth, Kennington and South Lambeth, later Vauxhall, and alienated to different people. Newington was held by the Archbishop of Canterbury but is said to have been held by Edmund Ironside, presumably as King, and this must have been in 1016 since he was only king for that year; he is said to have granted it to his jester who gave it to Canterbury. The only clear exception is Camberwell which belonged in 1086 to Hamo the sheriff and had belonged to a man called Norman before the Conquest but we have no earlier history of it. As I have argued in the newsletter, the Domesday entry for Southwark is incomplete, only having an entry for Odo, Bishop of Bayeux; but the King clearly held most of the burgh, as we can see from its later history, and the clerk who wrote Great Domesday just left it out, except for a reference at the end of the Odo entry; this anonymous clerk is my least favourite historical person! This does not mean that the King owned every blade of grass, but he was overlord of these areas; which is why I say the King held it rather than owned it. But this can probably be taken back much further. In 672-4 Frithuwald, sub king of Surrey, granted Chertsey Abbey some land near London which Tony Dyson originally suggested was Southwark: but later changed his mind to Lambeth, but may have included both since at 12 hides it is quite an extensive area. What probably happened was that when Chertsey succumbed to Viking raids the lands returned to the crown, as seems to happen elsewhere. It is interesting that though Chertsey preserved this charter through the middle ages, they never claimed the land back. By, c1300 though, the King had alienated nearly all this and neither held land nor lordship in this area (except for a small area at the foot of London Bridge which was not alienated until 1327), so we start again in the 14th century. The earliest royal presence was Edward II who leased three adjacent properties on the north side of Tooley Street, one of which was called the Rosere. The Rosere site belonged to a family called Dunley; in fact the only time it is known as the Rosere is while Edward held it, otherwise it is known as Dunleys. It is important to stress that Edward did not buy the site, he merely leased it; the first evidence we have of his involvement in the site is in late 1324 and there is no evidence that his son Edward III had any interest in the site after Edward n’s deposition in 1327, so we are only talking about 2.5 years at the outside. The site of the Rosere lay immediately east of Morgan’s Lane and this area has seen extensively excavated in recent years. These excavations did produce a small enclosure, surrounded by a moat with its sides revetted in stone, and the excavators claimed that this was the Rosere. However I do not think this is true, mainly because the building accounts for the Rosere that we have concern work done by carpenters and there is no reference to masons. It has been suggested that the masons’ work had been done before the surviving records start, but this is unlikely because the first entry is in the middle of the extant wardrobe accounts and there are no references to the Rosere before that Further, Edward leased two other properties, one called the Cage and the other owned by a man called Latimer, and I believe these lay west of Morgan’s Lane on the Tooley Street frontage and, since they are connected to the Rosere by a pentice, it seems more likely that the Rosere also lay on the Tooley street frontage and not at the back of the site. What was found in the excavation was, I suspect, a house built in the mid-15th century by Sir John Faslolf, but I have not been able to convince the excavators of this. From the building accounts it seems that the Rosere comprised a number of separate buildings rather than one large one and, though on a smaller scale and in timber rather than stone, probably resembled the house that Edward, known to us as the Black Prince, built for himself at Kennington a few years later. Edward III acquired Kennington and Vauxhall in 1337 from Lady de Burgh with what seems to have been a certain amount of compulsion; in fact Edward II had briefly acquired Kennington in 1316 and again in 1322 but had not kept it. Edward III wanted Kennington, and Vauxhall which was jointly owned with Kennington at this period, to establish an endowment for his son whom he created Duke of Cornwall in that year. Kennington has remained in the Duchy ever since but the Black Prince gave Vauxhall away to Christ Church Priory, Canterbury in 1362, who held it till well into the post-medieval period. Between 1337 and 1362 the Black Prince built himself a palace on the capital messuage at Kennington, though in the medieval period it was never called a palace; Kennington Place was the nearest they got. We excavated this site in the 1960s and showed that, as I mentioned above, it comprised a large number of separate buildings, more or less one for each function, rather than one large building, which is how we think of palaces today; in this it was somewhat old-fashioned. Thus we have a hall, a great chamber, a kitchen, probably a buttery/pantry block, a stable, and a number of separate chambers for other members of the household and officials. The other royal residence was down the river at Rotherhithe which was built by the Black prince’s father, Edward III. Edward acquired a small area of Rotherhithe in or before 1349 and built himself a small house there; this too has been excavated at a site called Platform Wharf. This is much more modern than Kennington and the Rosere in being a unified square building surrounded by a moat, not unlike that found on the Rosere site, and probably bad an outer bailey to the south. In this it is a precursor of the typical two courtyard palace that becomes the norm for the next two hundred years or more as in such palaces as Hampton Court, Nonsuch and Knole etc. There is good evidence that Edward used this, for a fair number of royal letters are dated at Rotherhithe in the following years, but at his death in 1377 he left it to St Mary Graces by the Tower so it ceased to be a royal residence and in 1399 Bermondsey Prior acquired it from St Mary Graces. The building itself seems to have survived however, and even in the early part of the last century the medieval north wall was still extant. For some reason it was called King John’s House though he had nothing to do with it. After this frenetic activity in the middle years of the 14th century, Southwark and Lambeth seem to become unfashionable places for royal residences. Kennington, of course, remained and was fairly heavily used by Richard n as a retreat from Westminster, just across the river. In fact he kept a boat at the end of Black Prince Road and for some reason he had a crane to get into it, though there is no evidence that he was less than sprightly. But after that it saw little use, partly because for long periods there was no elder son to be Duke of Cornwall and the King, who held it in those periods, had other palaces to use. Sometimes one of the ladies of the royal house would be given it, for example Edward IV gave it to his mother Cecily, but little was spent on maintaining it and few alterations were made, so it remained much as the Black Prince had left it. Its final moment of glory was with the arrival of Catherine of Aragon to marry Prince Arthur, elder brother of Henry VIII, when a joust was held there. In 1531, Henry VIII, no doubt feeling it was very old hat by then, demolished it and used the building material for Whitehall, the grand new palace he was building on the north bank to replace Westminster. Despite a number of local legends, that is the last time Kennington was used as a royal residence. Not quite the last in our area because only a few years later, in 1536, Henry acquired Suffolk Place in Southwark from his brother-in-law Charles Brandon. This was located in Borough High Street opposite St George’s Church and was ‘cutting edge’ at the time. Henry probably had some grand scheme for not only did he acquire that but he also acquired, a few years later, the overlordship of the whole of Southwark, apart from the area round the foot of London Bridge; he had done exactly the same in Whitehall before he built his palace there but it did not seem to develop in Southwark. In 1543 he also acquired the manor of Stockwell from the Leghs, including its manor house, and it is possible that he had some grandiose idea of a great hunting ground stretching from his Southwark house to Stockwell. Whatever ideas Henry had for Southwark Place, he must have abandoned them for he spent very little on it and rarely used it. In 1545 he opened a branch of the Tower mint there which lasted until 1551 and this must show that any idea of it being developed as a great royal palace had gone. Under his son Edward VI and daughter Mary, first the overlordships were disposed of and then the palace itself in 1556, which was then almost immediately demolished. After this there is no evidence that I am aware of for royal residence in Southwark or Lambeth and, as far as I know, Queen Elizabeth never slept here. The crown did acquire property occasionally, but this was usually inadvertent; for example in 1584 Elizabeth acquired the Maze, an area largely on the south side of Tooley Street, but this was only because its owner, Thomas Coply, was a Catholic who fled abroad in 1584 when things got too hot for him, and the property later returned to the family. Thus the mid-14th century was the great period for royal residences in our area but great residences of ecclesiastical and lay nobility were much more numerous and cover a much longer period and, of course, we still have one in Lambeth Palace.